Let your love sweep you away like the wide rolling beaches on the coast of Broome. The broom wedding dress is an ivory lace vintage inspired delight. 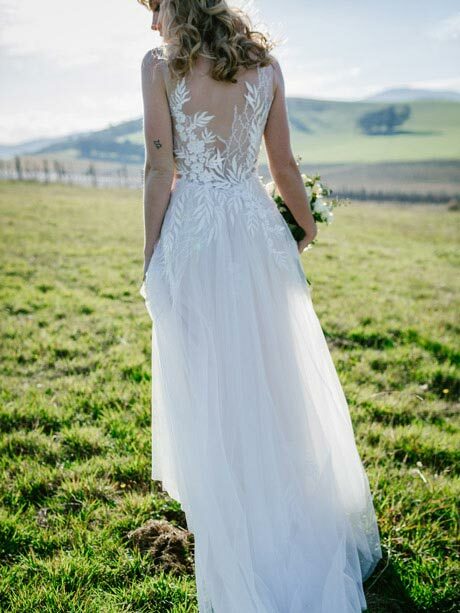 This wedding dress style is made to order in Melbourne by Hello Lovers Australia. The Broome lace wedding dress from Hello Lovers Australia captures the essence of the vintage destination bride in one dress. Heavenly for a summer time beach wedding or country wedding. How about the Broome wedding dress for your winter wedding with a classy V neckline. The V neckline opens up the face and also allows for the option of a stunning wedding necklace to be worn with this gown such as the nivana wedding necklace. Long stretch lace 3/4 length sleeves. The Broome dress is made to order so please allow 8 weeks for us to get busy sewing in the work room. For more information please read our wedding dress size guide. Worn with our faith rosary beads and earrings. I couldn’t help but show you some photos of the Broome dress worn by our Morgan, one our Hello Lovers Australia real brides who had pre wedding photo’s at Princess Pier and got married at the Melbourne botanical gardens. If you wedding dress needs alterations and you are in Melbourne we recommend Ginger pins bridal alterations. Possibly the only alteration that would be needed would be the hem. Depending on the height of the bridal shoes your are wearing. Your gown hem line should clear the ground when you walk so you don’t trip over. 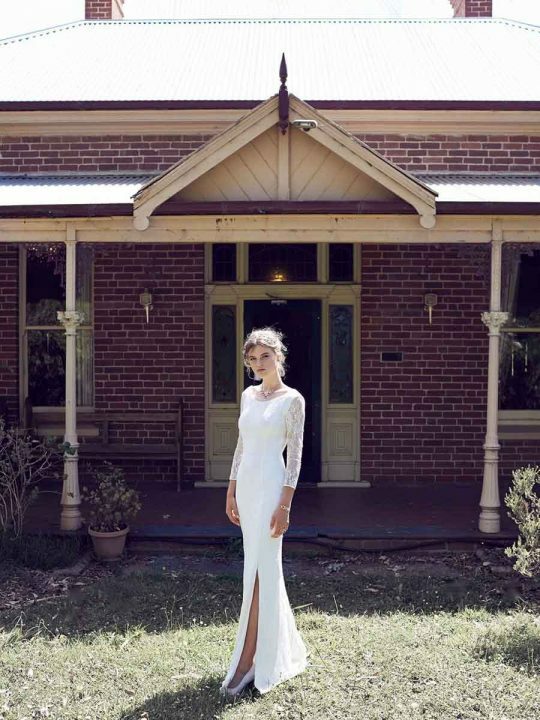 If you would like to try this gown on and you are in Melbourne call Leah S Designs and arrange an appointment they have the full range of Hello lovers Australia wedding dresses an wedding jewellery in store to try on. And would be happy to help you.